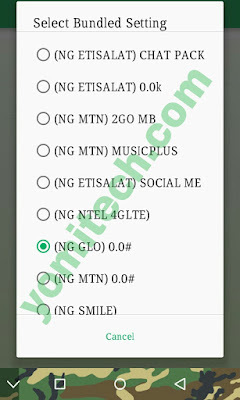 The Glo N0.0 unlimited browsing is no doubt the longest tweak we have had this year. This tweak has actually been on for a couple of months now and it's still blazing like ever. I guess the reason why it lasted this long is because Glo network is actually very poor in many locations and so not everybody is using it. Although this tweak is working with modded psiphon but a lot of people complain about the internet speed been throttled after using about 10mb. But if you want to take full advantage of this tweak, the best option is to use tweakware VPN. That's actually the best way to bypass speed throttling. => Setup your phones APN as shown below. => Download the latest tweakware VPN from playstore or from this Link. => Launch the tweakware VPN app and click on settings at the top right corner of the screen. => From the settings options, click on bundle settings. => Tick "Use Bundled Settings"'. => Click on "Select Bundled Settings" and choose "(NG GLO) 0.0#. => Now go back, choose any server and click on connect. That's all guys. You have just setup your tweakware VPN app for Glo #0.0. Enjoy it while it last. Note: While the premium tweakware account is unlimited, the free account gives you less than 300mb per day. But the good thing is that you can actually bypass the daily limit. If you want me to publish a post on how to bypass tweakware daily bandwidth limit then let me know in the comment box below. Also if you any question to ask, just drop it in the comment box below and don't forget to share this post.